I’m taking part in Gumroad’s Small Product Lab, which gives me 10 days to take an idea from just that to an actual thing that people can buy. I’ll be writing about the process here on my blog and this is my first update. Forgive any awkward sentences. This is agile writing. A minimum viable blog post. Or whatever. This was the easy bit. Earlier this year, I talked on the Write for Your Life podcast about my writing style guides. They are simple but very useful templates I’ve used for years in my day job as a copywriter and communications bod. I’ve long thought about turning them into something sellable and this seems like the perfect opportunity. It’s hard selling stuff though. Even promoting my actual published book sometimes feels an intrusion on folks’ online space. Listeners to the podcast will have heard me and Donna talk at length about the challenges of trying to flog our wares. It takes a lot of confidence and very little fear. You have to remember that people might, you know, actually want what you’re peddling. The fear part of selling online is interesting. 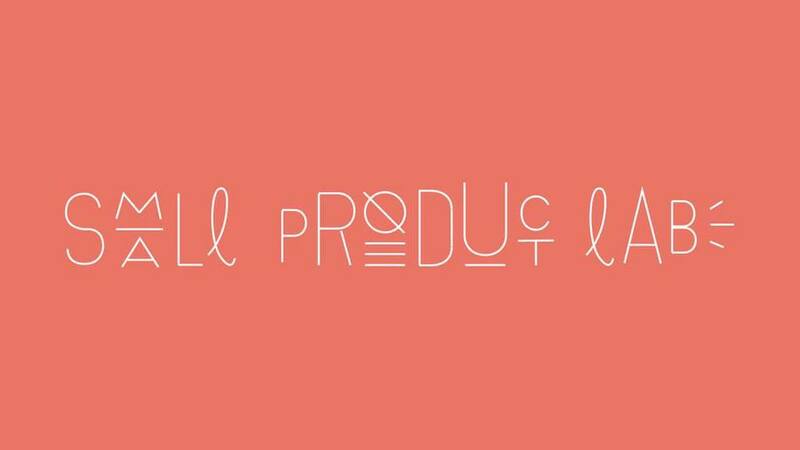 There’s a private Facebook group for people taking part in the Small Product Lab. On there I’ve seen plenty of people saying that ‘fear’ is why they’ve not tried to sell before. What if no one buys it? Won’t I look like a right nit? The answer is almost always no and the whole point of creating a small product in 11 days is to go through the process. To actually make and launch. Day 3 (tomorrow) is about creating a landing page. I’m slightly ahead and have already bagged www.writingstyleguides.com to start taking sign-ups from people interested in the templates. If that’s you too, go ahead and check it out. I’ll add to the page and talk about how I made it my next update here. As many of you reading will know, I have a full-time job, identical twin toddlers and a second novel I’m working on. Time is not by pal at the best of times. However, I am confident that I can launch the product on schedule. Like everyone else taking part in the Small Product Lab, I’ve put together a to do list that I need to get through in the time that I have. I use Todoist to manage all of my projects, both at work and at home. 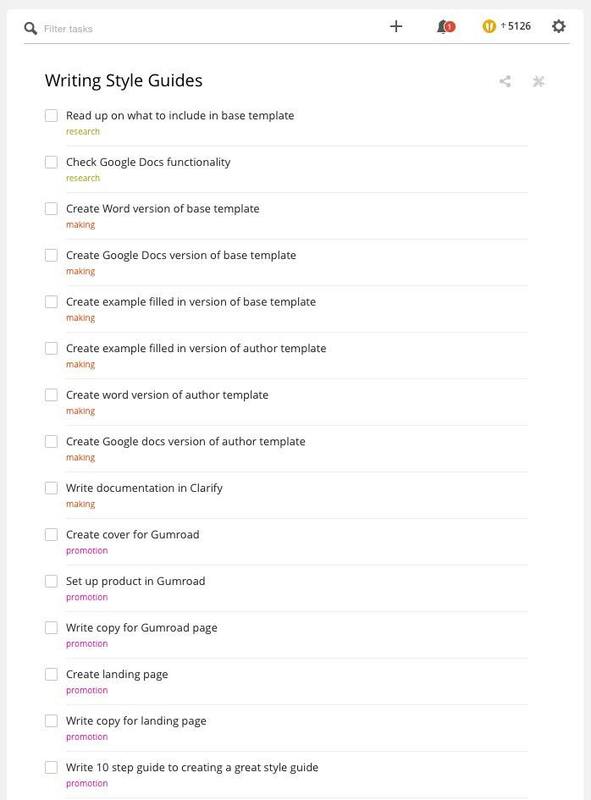 It made sense to create a new project for my style guide templates in Todoist and start adding tasks. I took a specific approach to tasks. I listen to the excellent Cortex podcast with CGP Grey and my old mucker Myke Hurley on Relay.fm. Grey has talked numerous times about how he creates tasks for every single thing he has to do – nothing general or wishy-washy. I decided to do the same. Instead of ‘Create landing page’, I’ve added multiple smaller tasks that add up to the larger goal. This is helping me focus and it’s something I’ll try with other projects. I’m also using the label system built into Todoist. This is a fast-paced, simple project, so I’ve not gone overboard with my labelling. In fact, there are just three labels: research, making, promotion. This gives me some sort of order to my tasks and it’s interesting to see just how much of what I need to do comes under promotion. As with writing a novel, the ‘making’ bit is only the beginning. That’s it for today. I intend to log my progress here, so do feel free to sign up to the RSS feed or my email newsletter if you want to follow along. I’ll also be linking back here from Twitter, if that’s how you like to get your bits and bobs. And comments! Feel free to leave a comment below, if you have any tips, suggestions or outright safety warnings.